Senator Chuck Grassley took to Twitter this morning to personally apologize to President Donald Trump about not being to be able to fight for his tax plan on the House-Senate conference committee. Iowa’s senior senator was apparently dropped from the committee that will draft the final legislation that gets sent to Trump’s desk. The move by Republicans to downgrade Grassley’s role in the process comes days after the senator’s widely-panned quote on working people spending all their money on “booze or women or movies” garnered national headlines. The comment in relation to the estate tax confirmed what many people thought about the Republican tax bill – that the GOP only cared about the wealthy based on an arrogant, elitist worldview of the working class. 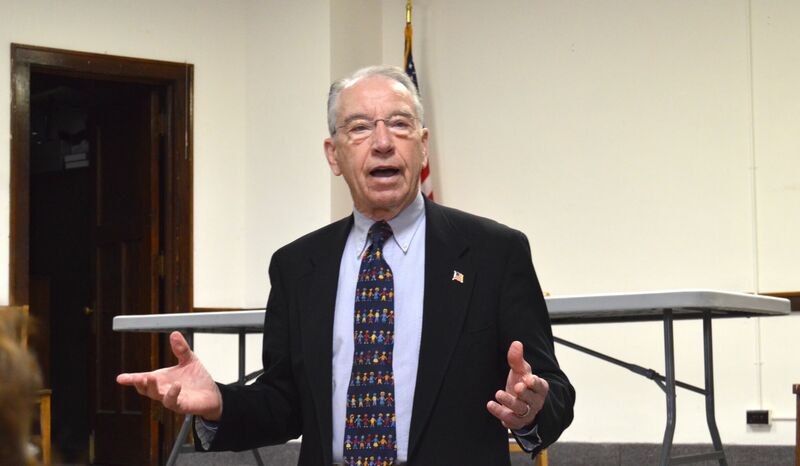 It’s no surprise that Republicans don’t want Grassley anywhere near the final process. He’s probably not someone who would be the best messenger in the press right now to talk about specific measures in the legislation. The Senate voted yesterday to go to a conference committee with the House to reconcile the differences between the two chambers’ versions of the tax bill. They are looking to finish up their work on it by Christmas so that Republicans and Trump can finally say they passed one major piece of legislation in their first year. How dare an elected official look down upon the middle class with a statement such as this! He deserved to be dropped from the committee and deserves to lose reelection as our senator. I am disgusted, sad and angry at the type of person he has become. He needs to remember that his job is to work for all of us, not the top 0.2 percent of wealthy citizens. He needs to be replaced with someone who will work for us all! Grassley is still just a pawn in McConnell’s hands. Blocking Merritt Garland showed Grassley has no agency. What a pitiful ending of a very long Senate career. “The Working Poor,” as your Article above states, usually work 10-12 hours per day in order to provide for their families, and they are often “Single Parents.” Their incomes are usually below $10,000/ year, which is WAY BELOW NATIONAL AVERAGE. In order to “bridge the gap” between their income and their expenses, they ask for Social Assistance, which usually does not last more than 6 months maximum. (In some cases, it may only be one or two months!) If they are found to spend the money on “booze or women or movies,” the Department of Economic Security takes the money away from them. These cases are reviewed every 6 months. Senator Grassley should have done some Research, before he opened his big mouth! A National Survey conducted several years ago revealed that less than 1%-2% of so – called “Welfare cases” involved Fraud. The problem is not just Senator Grassley my dear Republican friends–it is the entire bill that is flawed he just got punished for telling the truth about it. Every single one of your lemmings will follow each other over the cliff to take from the people who need help any chance of hope. What shows in your magical mirror? It bears pointing out that the point of killing the estate tax is precisely to allow as much money as possible to be left to people who *did nothing to earn it*. Shame! Shame! Shame! On you Senator Grassley. When did you forget your roots!